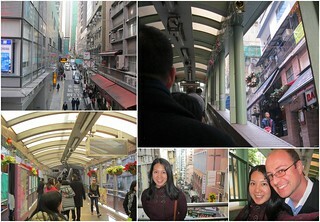 Dan and I spent the end of 2012 and the beginning of 2013 in Hong Kong. 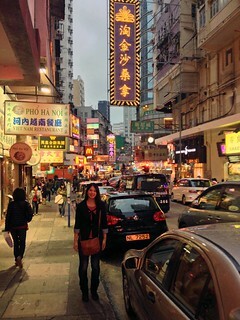 It wasn’t my first trip to Hong Kong but it was Dan’s. I’ve been meaning to write a recap of our trip, but rather than go day by day I’m going to do some highlights of things that we saw and did. I’ll recap about the food in a separate post. As a disclaimer, I love doing cheesy touristy things (even in Toronto where I live). So you have been warned. In no particular order, here are 15 things that we saw and did in Hong Kong. 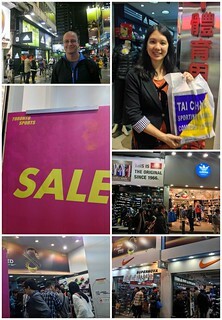 Shopping in Hong Kong is an experience. I could do an entire post about shopping (maybe I will). What I love about Hong Kong is that they have access to goods that you wouldn’t ordinarily see in North America. I love visiting SOGO (a Japanese department store) and looking at the food, electronics, clothes, shoes, everything. 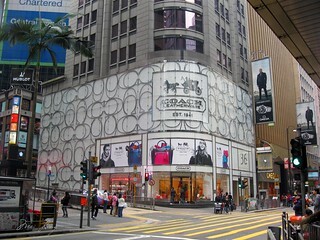 The SOGO in Causeway Bay is 13 floors and one of the biggest department stores in Hong Kong. The malls in Hong Kong are absolutely amazing. We visited the Lee Gardens area with the newly opened (at the time) Hysan Place. 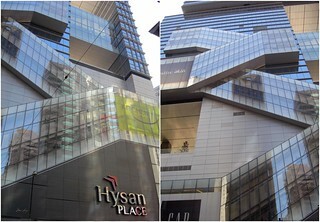 Hysan Place has 17 floors of shopping and food, with the Eslite bookstore taking up a few floors in it as well. While I loved looking at all of the designer goods (the IFC mall was one of my favourites) I also enjoyed shopping at local chains like Bossini, which is kind of similar to a Gap or Old Navy. 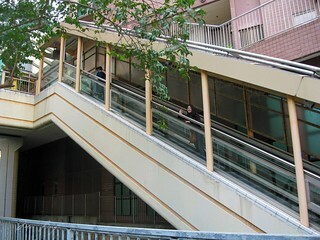 View of the escalators from the outside of Hysan Place. While we’re on the topic of shopping, besides the many stores, outlets, malls etc. 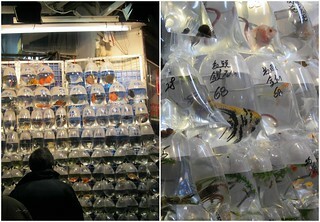 Hong Kong also has many amazing markets. Some of them are very touristy, which is why I was drawn to them (also Dan had never seen anything like it before). I told Dan that we had to stop so I could take a picture of this man singing Cantonese opera with a dog in his shirt. Dan wasn’t impressed. 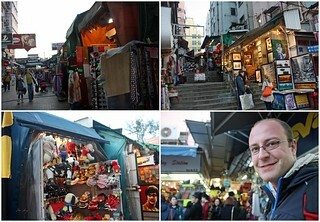 The Ladies Market in Mong Kok has food stalls, clothing, goods etc. 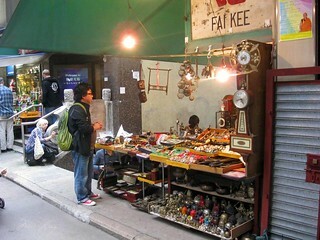 It was fun to walk around and browse and hear people haggle. I love sneakers so it was exciting to visit this street lined with sneaker stores. Dan and I after shopping on Sneakers Street. We laughed at the “Toronto Sports” store and didn’t go in. Yes a whole market full of goldfish! Dan was really impressed here. There’s also a bird market that we walked through but I didn’t get any pictures. The flower market is beautiful. We also enjoyed walking through here. 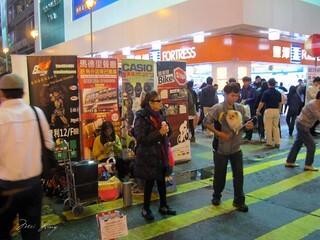 The Stanley Market in Stanley is really popular. They sell brand name goods (and I think a draw for tourists and expats is that they’re in larger sizes. 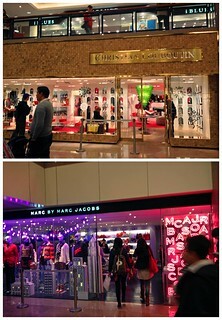 Hong Kong sizes tend to run smaller), accessories, art and more. They weren’t kidding about having “bigger” sizes in Stanley Market. 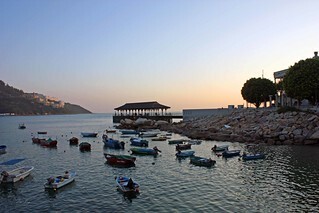 Stanley is a town located on the south side of Hong Kong Island. 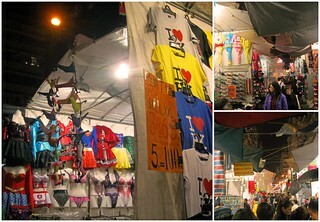 It’s popular with tourists because of Stanley Market and its beautiful beaches. Dan and I spent a few hours strolling around Stanley. I would definitely come back again and spend more time here (and in other areas on the south side in general). The Mid-Levels Escalators is the longest outdoor covered escalator system in the world. It stretches for over 800 metres connecting the Mid-Levels to Central on Hong Kong Island. The escalators only go one way since there was only room to build one. There are stairs alongside the escalators if you need to go in the other direction. 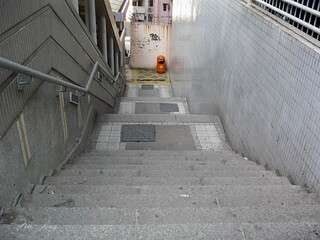 In the morning between 6 – 10 a.m. the escalators go down so that commuters can use them to get to work. After 10 a.m. they go up until midnight. Dan and I rode the escalators all the way up one day and then walked back down. It took about 20-30 minutes to ride them up. Since the escalators only go one way, we had to take the stairs back down. We stayed in the YWCA – Garden View, which was located right by The Botanical Gardens on Hong Kong Island. When people think of Hong Kong I think they often think of a big city skyline (especially when they think about Hong Kong Island and Kowloon). That’s how Dan felt before visiting. He didn’t realize how much green space there actually is.The Botanical Gardens are absolutely amazing. 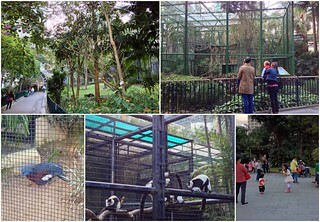 We enjoyed strolling through them, seeing the plants and visiting the animals. There’s also a fountain where we saw people relaxing and doing tai chi. 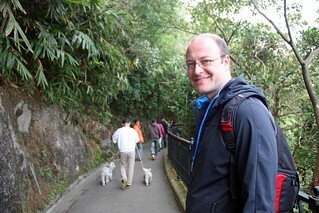 We also strolled through Hong Kong Park a few times but never stopped to explore it in depth. Maybe next time. 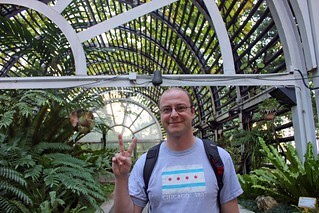 Dan in the greenhouse in the Botanical Gardens. 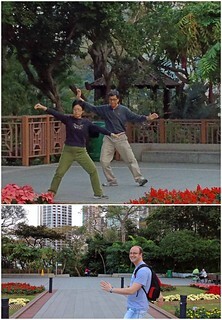 Tai Chi in the Botanical Gardens. Amazingly peaceful. 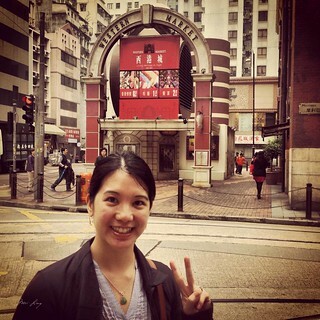 Located in Sheung Wan, Hong Kong Island, Western Market is the oldest surviving market building in the city. 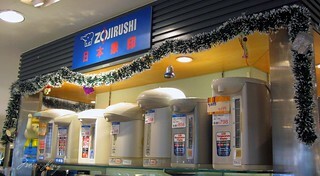 Right now they have bakeries, dessert places and you can visit to find lots of fabric merchants. The top of the market is a restaurant but we weren’t able to visit it because there was a wedding reception there at the time. Me outside the Western Market. 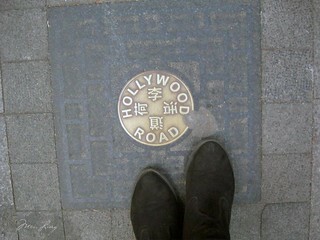 Hollywood Road is a street that runs through Central and the Mid-Levels in Hong Kong Island. Dan and I took a walk through here to look at antiques and trinkets. 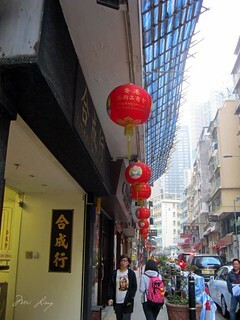 Man Mo Temple is also located on Hollywood Road but we never made it inside. Maybe next time! Dan and I at The Peak. 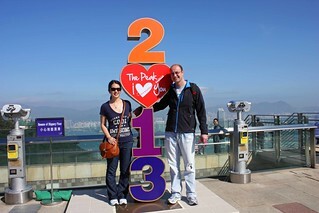 You can’t visit Hong Kong without visiting The Peak (unless you’ve already seen it I guess). After riding up the historic peak tram (or taking a bus up the winding roads) the Peak offers spectacular views of Hong Kong and the harbour. There are also beautiful trails in the area that are worth exploring. 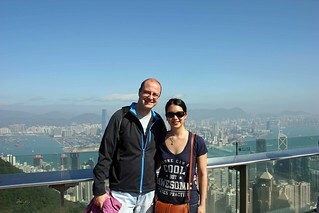 The last time I had visited Hong Kong The Peak Tower didn’t exist so we decided to pay extra and go up the Peak Tower. 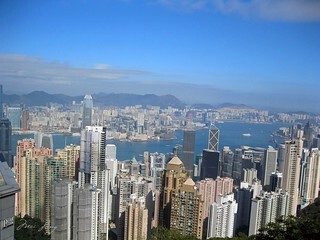 You can also go to The Peak Galleria for a nice view of Hong Kong without paying for a ticket. Madame Tussaud’s Wax Museum is located in The Peak Tower (we didn’t go) as well as a number of restaurants and cheesy souvenir shops. There’s shopping, food and snacks in The Peak Galleria. I particularly enjoyed shopping at Bossini (of course) and G.O.D. 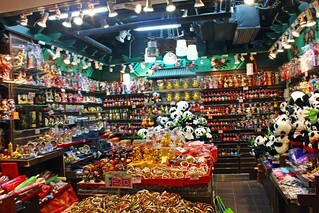 (Goods of Desire) for souvenirs and clothes. Bruce Lee outside Madame Tussauds. I should have taken a picture with him while there were no people around! Dan walking on one of the trails. 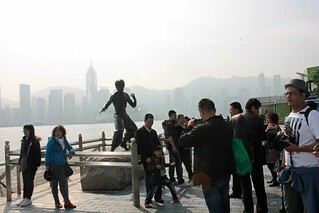 After riding the ferry from Hong Kong Island to Kowloon (also a definite must), any visitor to Hong Kong needs to take a walk along the Tsim Sha Tsui East Promenade. 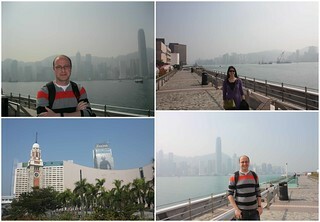 Again there’s a beautiful view of the Hong Kong Island skyline and harbour from the promenade. 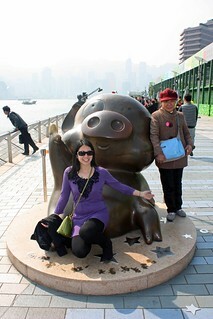 The Avenue of Stars is also located nearby where you can see the handprints of famous Hong Kong stars (I put my hands in Maggie Cheung’s handprints. It was exciting). There’s also a statue of Bruce Lee and McDull. 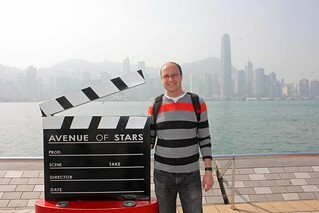 When we went it was very busy on the Avenue of Stars so it was impossible to get a picture with Bruce Lee. I did manage to jump into McDull’s lap for a quick picture though. Hong Kong’s Symphony of Lights is the world’s largest permanent light and sound show. 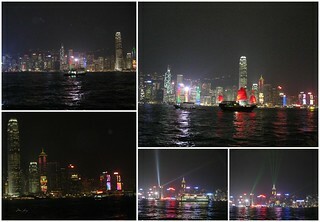 It takes place every night on Victoria Harbour and is amazing to watch. 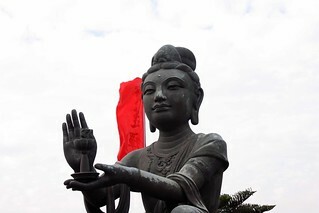 The Tian Tan Buddha (also known as the Big Buddha) is located on Lantau Island. The statue is constructed out of bronze and was completed in 1993. In order to get to the Tian Tan Buddha you can hike the many hilly trails on Lantau Island, or you can ride the Ngong Ping 360 Cable Car. We rode the cable car after waiting in line forever (it’s a long story. 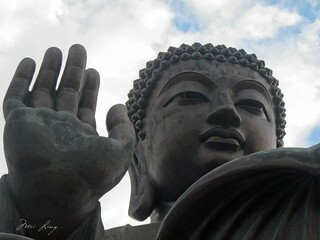 I may do a post about the Tian Tan Buddha later). 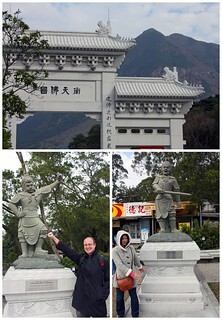 The Tian Tan Buddha is located near the Po Lin Monastery. 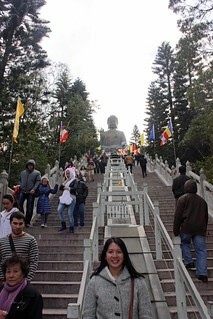 In order to get to the top to view the Buddha you also need to climb 268 steps. 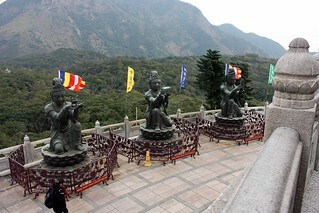 Visiting the outside of the Tian Tan Buddha is free. If you want to go inside there is a small fee. While we were there, we also enjoyed the view. We didn’t go into any of the cheesy gift shops in Ngong Ping Village. 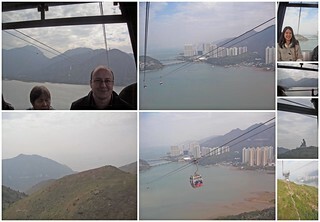 Riding the Ngong Ping cable car. Dan with the Rooster statue. Me with the Dog statue. Dan and the Big Buddha. Close up of the Big Buddha. I felt like he was watching us. View from the Big Buddha. 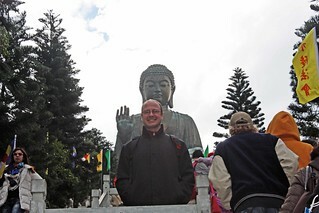 Me with the Big Buddha. There were a lot of stairs. The Offering of the Six Devas statues (three of them). Close up of one of the six devas. 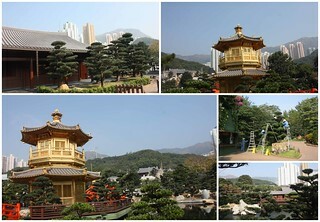 Located in Kowloon this Buddhist complex was originally built in the 1930s. It was rebuilt in 1998 without using a single nail. 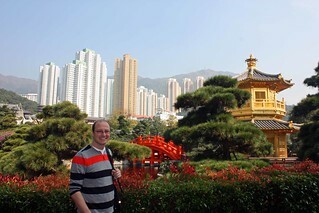 We also visited the Nan Lian Gardens beside the Chi Lin Nunnery. Both areas were peaceful and the plants were well taken care of. 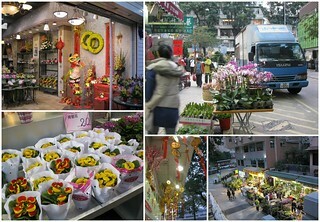 There were lotus flowers and goldfish and it was a nice relaxing break from the bustle of Kowloon. 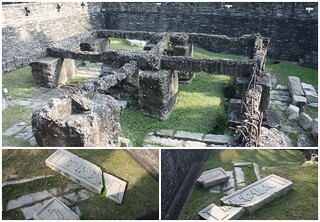 As its name suggests, the Kowloon Walled City Park sits on the remains of the Kowloon Walled City. The Kowloon Walled City was excluded from the treaty between the British and the Chinese in 1898. Even though technically it remained under Chinese rule, the Chinese troops had to leave the city, leaving it a lawless city within a city in Hong Kong. The Kowloon Walled city was only about 3 acres of land, so they built buildings on top of buildings on top of buildings. An estimated 33,000 people lived in the city and eventually in 1987, with the agreement of China, the government relocated its residents. 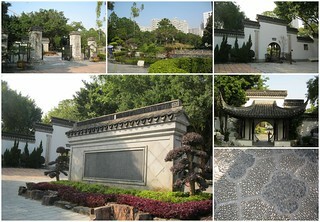 It has since been transformed into a park. The last remaining original gate. 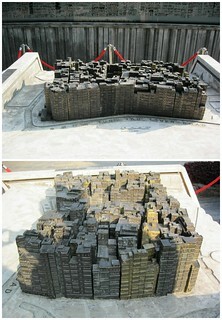 A model of what the Kowloon Walled City looked like. When I visited Hong Kong when I was 14, my grandma insisted that we go to Ocean Park. I was excited because I wanted to go on the rides, but grandma had different ideas. After viewing all of the fish, she wanted to leave. After crying (yes I cried) I was allowed to go on one ride before we left. Flash forward 15 years later and things have changed. 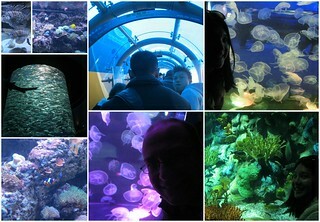 When Dan and I visited Ocean Park, all we wanted to do was look at the fish and at the pandas and red pandas. I had no interest in going on the rides this time (maybe if we’d had more time we could have spent a whole day there). Ocean Park is an incredible amusement park divided into two sections. 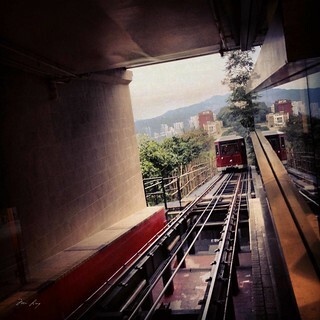 You get to each section by riding a cable car (or a train). The rides here far surpass the rides at Hong Kong Disneyland and the animals and sea creatures that you can see are truly spectacular. You just need to be able to handle the crowds. Being much taller than many of the other visitors, Dan and I were always able to see what we wanted to see. Enjoying the aquariums in Ocean Park. 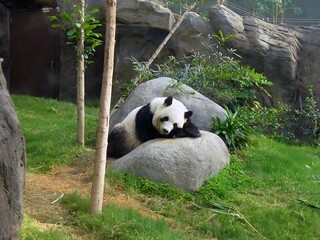 One of the Giant Pandas in Ocean Park. 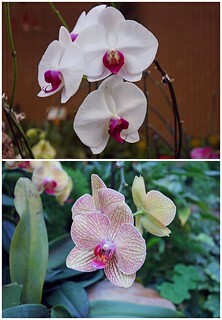 They were a gift from mainland China. I would usually say skip Hong Kong Disneyland. It doesn’t compare at all to Disneyland in California or to Disney World in Florida. 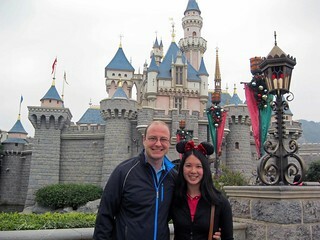 Because Dan and I had been fortunate and/or spoiled enough to visit both of these theme parks in 2012, we decided to visit Hong Kong Disneyland to round it out (yes 3 Disney theme parks in one year!). The lines at Hong Kong Disneyland are much shorter than any Disney theme park I’ve ever been to. They are actually shorter than the times they tell you when you enter the line. With that said, the rides are nowhere near as thrilling or fast as the rides in the other two parks (I can’t speak for Tokyo Disney or Disneyland Paris because I’ve never been. Maybe someday). 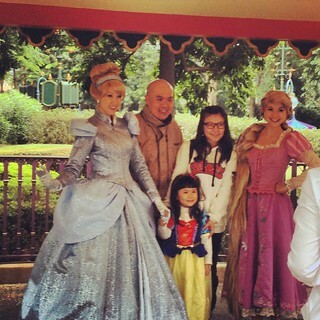 Hong Kong Disneyland does appear to cater to Asian visitors. If you want your picture taken with a character, you have plenty of opportunity. 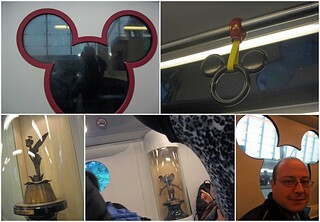 I also love the MTR train that takes you to Disneyland (it has Disney shaped everything in it!). My favourite part of our visit to Hong Kong Disneyland was the Buzz Lightyear ride (my favourite Disney ride ever). I managed to score a million points, out shooting Dan yet again. The Disney themed MTR train. A family poses with Cinderella and Rapunzel. 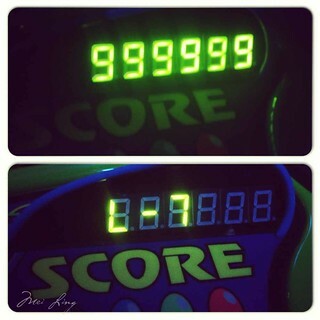 My high score. L-7 means over a million points! Stephen and Stitt actually have nothing to do with the Hong Kong Museum of Art. I just needed to put them together to keep it at 15 things. 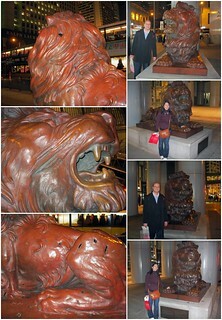 Stephen and Stitt are the two bronze lions located outside of the HSBC building in Central, Hong Kong Island. Stephen and Stitt were the original bronze lions from the building in 1935 and the Japanese used them as target practice during World War 2 (you can still see the bullet holes in them). Dan and I made sure to rub their paws for good luck. 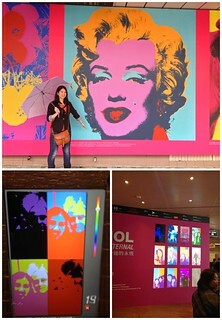 While we were in Hong Kong we also spent a rainy day at the Hong Kong Museum of Art in Kowloon. 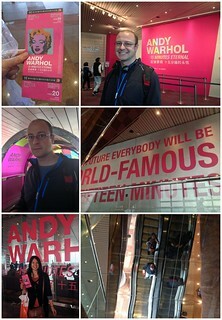 Here we saw the Andy Warhol: 15 Minutes Eternal exhibition for a whopping $3 Canadian. In Toronto I’m fairly certain an exhibition like this would have cost us $29.99 each. We really enjoyed the exhibition and are happy to have had the opportunity to get up close and personal with Andy Warhol’s work. Finally, I’m most thankful for our trip because it was the last time I saw my grandma. When I hugged her goodbye I even thought that maybe this would be the last time. She passed away 6 months later at the ripe old age of 90. 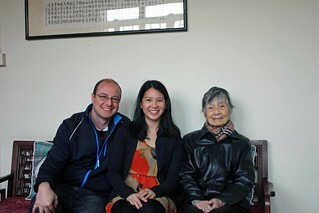 I mentioned to Dan that when I went to Hong Kong in 1997, my grandpa also passed away about 6 months later. I consider myself lucky to have had these opportunities to see them one last time. 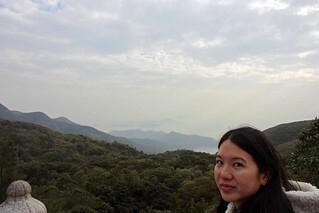 There is so much to do in Hong Kong, we didn’t get to see even half of what we wanted to see. Someday I hope to go again and explore some more. It’s a beautiful place and I highly recommend it to anyone. I’m hoping to do a blog post about the food and one about the transportation there (and maybe more on some of the things we did that I’ve highlighted here).